Alicia Hooper is a graduate student at George Mason University. During the 1990s, post-Soviet Georgia initially struggled to foster democracy. Its government was marked by former Soviet bureaucrats and widespread corruption. However, after the largely peaceful, pro-democratic Rose Revolution of 2003, Western educated Mikhail Saakashvili became president and rekindled hopes for democracy in post-Soviet Georgia. Since his inception, the new president has initiated a wave of reforms in order to bring Georgia out of Russia’s shadow and into the Western spotlight. Saakashvili’s reforms included restructuring of Georgia’s police forces, streamlining the bureaucracy, and facilitating economic growth, but also crackdowns on the separatist regions of Svaneti, South Ossetia and Abkhazia. Though the latter endeavor eventually failed, Georgia under the tenure of Saakashvili accomplished a substantial rapprochement with the United States and Europe in a bid to include his country into NATO and the European Union. Notwithstanding these successes, on October 1, 2012, Georgian billionaire Bidzina Ivanishvili of the Georgian Dream party claimed victory over Saakashvili’s party in parliamentary elections. Georgia’s most wealthy man, with a net worth of $6.4 billion dollars, Ivanishvili entered the political sphere after spending significant time in Russia, where he had accumulated his wealth during Russia’s privatization era after the collapse of the Soviet Union. And while President Mikhail Saaskashvili does not formally leave office until 2013, the freshman Prime Minister Ivanishvili has not hesitated to distinguish himself as both a Georgian reformer, as well as a potential threat to democratic development. In the first few months following his victory, Ivanishvili passed amnesty to around 3,000 “unfairly” incarcerated prisoners, conducted arrests amongst the opposition, and has begun to buy-out Georgian media outlets. Apart from these overt potential threats to Georgian democracy, there are, moreover, also more subtle developments under Ivanishvili’s young regime. They, for instance, take the form of two monuments to Georgia-born Soviet leader Joseph Stalin that have recently been restored in Zemo Alvani and Akura in eastern Georgia for the anniversary of Stalin’s birthday on December 21. A third monument will be replaced in the central Georgian town of Gori after the town’s residents successfully gathered 5,000 signatures in a petition to return Stalin to his former place on town square. While at first glance Georgia’s restoration of Stalin monuments may seem innocuous in the shadow of Ivanishvili’s more aggressive policies, the implications of such developments are too significant to brush aside. 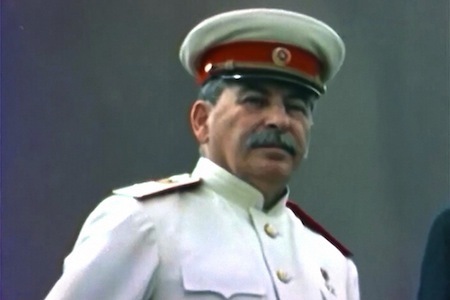 Joseph Stalin was a key figure in the twentieth century, whose specter still looms over the countries of the former Soviet bloc, Georgia and Russia in particular. The mustachioed leader has enjoyed a moderate rehabilitation in Russia and it appears that his home country of Georgia may be following in Russian footsteps. However, Stalin’s rehabilitation is more than nostalgia for a by-gone era. It presents significant concern for the future of democracy in Georgia. Stalin is a dubious figure. His resume is highlighted by the Soviet Union’s victory over German fascism in World War II and modernization via rapid industrialization, juxtaposed against a legacy of immeasurable human suffering and multiple genocides. Stalin, whose nom de guerre means “man of steel”, was born as Joseph Vissarionovich Dzhugashvili in the small village of Gori, Georgia in 1879. Though he later shaped his appearance and took up Russian in order to russify himself and fit in with Russia’s Bolsheviks, he is arguably Georgia’s most famous figure, regardless of having to share a place with Russian history. And as one of history’s globally recognizable persons, Georgia understandably has a tough balance to strike on how to address him. But when it comes to Stalin, his native Georgia is unique. De-Stalinization in 1956 provoked widespread riots in protest of the insult to the Georgian people, forcing Moscow to send in the troops. More recently, the 2010 removal of Gori’s Stalin statue and the recently redacted plans to change the town’s Stalin Museum into the Museum of Russian Aggression sparked (more muted) protests. Georgia’s disownment of her bittersweet national figure can be seen as a desire to depart from a bygone era of cultural repression under the Soviet Union. It is also as an attempt to return to traditional Georgian values of individualism and cultural richness while establishing a new Georgia that is oriented to the West. Even as Georgian desire to be close to the United States remains high, at an approval rating of 71 percent according to a 2011 survey by the Caucuses Research Resource Center, there is no guarantee that this will stay static in light of Ivanishvili’s reforms. Despite Saakashvili’s best efforts to create a new Georgia, a post-Rose Revolution Georgia was haunted by only partially met promises that came in the form of continued widespread poverty, high unemployment, setbacks in potential European Union membership, and a failure to completely reform the judicial system. All of these realities were exacerbated by the repercussions of the global economic crisis, the 2008 territorial loses of Abkhazia and South Ossetia, and magnified disappointment after the Rose Revolution caused by media overexposure and overexcitement. In the face of crippling realities and under the threat of a resurgent Russia, Ivanishvili’s influence on replacing statues of Joseph Stalin speaks as an appeal to captivate Georgian imagination and even national pride. The danger with this form of soft power is that younger generations of Georgians may be unaware of the extent of Stalin’s crimes. Stalin’s symbolic strength may even become appealing to a citizenry that is witnessing aspirations to become Western slowly diminish. In light of economic hardship and the ambitious Ivanishvili, reigniting admiration of an idealized Stalin will provide dangerous comfort. And even if the Stalin statues remain a demonstration of Ivanishvili’s soft power, they serve as a reminder that even though the original Stalin has long since passed, Georgia is still in his grip in the twenty-first century.